I received my Bachelor’s Degree in Shanghai Jiao Tong University. 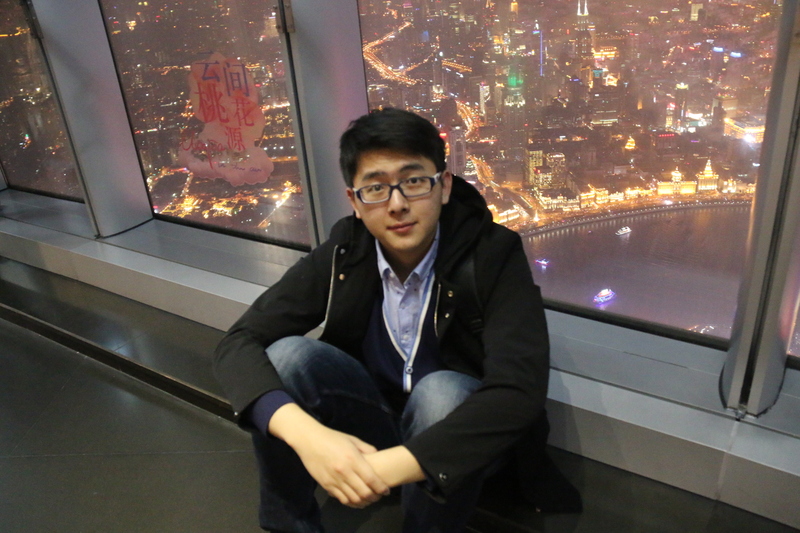 My undergraduate research advisors are Prof. Yong Yu, Prof. Weinan Zhang and Prof. Jun Wang (University College London). My research interests lie in the general area of machine learning, particularly in deep representation learning and reinforcement learning, as well as their applications in sequential decision making, generative modeling, natural language understanding and multi-agent systems. November 3, 2018. One paper accepted to AAAI 2019. July 17, 2018. I will serve as a PC member for the 33rd AAAI Conference on Artificial Intelligence (AAAI-19). April 12, 2018. New preprint: “CoT: Cooperative Training for Generative Modeling”, a new paradigm for training tractable density generative model that is parallel to adversarial training. Available on arXiv. November 28, 2017. A paper was accepted in the NIPS-17 Aligned Artificial Intelligence Workshop. November 12, 2017. A paper was accepted in the AAAI-18 Artificial Intelligence for Imperfect-Information Games Workshop. August 25, 2017. We started the Multi-Agent Reinforcement Learning reading group. August 9, 2017. I won the Best Paper Award Honorable Mention at SIGIR 2017. August 6 - August 12, 2017. I attended the 40th International ACM SIGIR Conference on Research and Development in Information Retrieval held in Tokyo, Japan. July 26, 2017. I gave an online talk on “Generative Adversarial Networks for Discrete Data” at PaperWeekly. May 19, 2017. A paper titled “A Dynamic Attention Deep Model for Article Recommendation by Learning Human Editors’ Demonstration” was accepted at KDD 2017. April 19, 2017. I gave a talk on applying adversarial training techniques for information retrieval at Apex Lab, Shanghai Jiao Tong University. April 11, 2017. 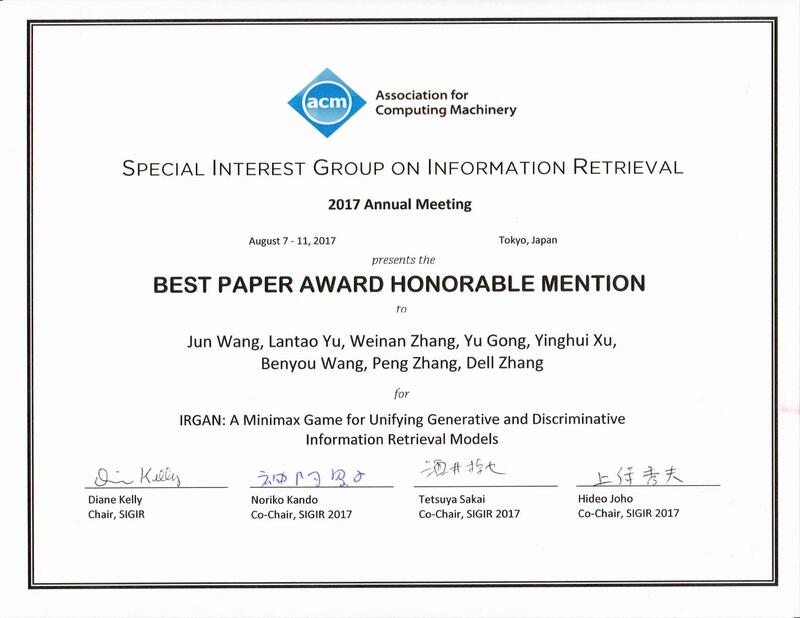 A paper titled “IRGAN: A Minimax Game for Unifying Generative and Discriminative Information Retrieval Models” was accepted at SIGIR 2017. February 4 - February 9, 2017. I attended the Thirty-First AAAI Conference on Artificial Intelligence held in San Francisco, California, US and gave a talk on applying adversarial training for generating sequential data. November 11, 2016. A paper titled “SeqGAN: Sequence Generative Adversarial Nets with Policy Gradient” was accepted at AAAI 2017.